WOW! 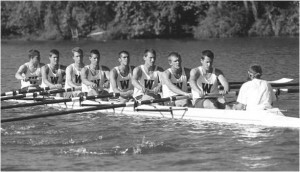 I just watched the 2009 Cal/UW Dual on Row2K.com – What a race! It was 8 years ago that I last wore the “W” of Washington on my chest into battle. It was as captain of a very talented group of men. Watching the dual on-line brought me back to my last dual race against Cal. I also remember in 1998 when the polls came out with us on top. My chest swelled; it felt great to be considered the best by the rowing community. Well, that was the year that Cal started their surge – and our ranking amounted to very little at the Pac 10s as we lost to Cal. I will never forget the Cal freshman coach yelling to us after the race to: “Get used to it Washington, get used to it”. Not many from that crew will. We rallied and beat Cal that year at the IRAs, but Princeton got the better of both of us. It is extremely easy to follow your coach blindly when you are winning – it is equally as hard to keep that faith when you start to lose. Going into the 2009 season, boys, you were ranked number one, for good reason. Well, that didn’t last long. From up here in Canada it looked as if you boys had a few expectations going into San Diego – and why not? I did for you too! Your cage was rattled, and then Wisconsin and Stanford both struck hard at Redwood Shores. I can only imagine what the flight home to Seattle was like for you. It is at moments like that when your character as men is tested. The entire team had to rally behind the leadership of Mike, Luke, Will and Rob. The entire team had to follow, trust, and believe. The entire team, from the Coach, to the Captain, to the Stroke to the Spare, had to make winning against Cal at the Dual your number one priority. Cal had the target on their backs! Well done Washington – you bounced back from San Diego and the Redwood Shores. You raced hard against Cal and it worked. You believed. But the season is long. Now is the time to reflect on what you learned flying home from the Redwood Shores. Now is the time to apply those lessons with fervour. It really doesn’t matter who tops the polls this week – does it? Lock and load. Put your heads down. ML: no more noises to inspire your competitors. You have found yourself in the middle of a street fight, and the tides will turn a few more times before the IRAs. Hang on tight – but do more than just go for the ride. With every training stroke you row, with every kilometre you erg and with every start-line you place your bow-ball: think about the finish line of the final at the 2009 IRA Regatta – and think about how much better it will feel 8 years from now having done everything you could have done to win. Looking back, it will help you sleep at night. If you do everything in your power then you will show your competitors the respect they deserve. If you do everything in your power then you can have the confidence at the start-line of the IRAs that you can move 5 seats in 10 strokes. If you do everything in your power then you will prove the first poll of the racing season right. Be a positive role model for someone today!